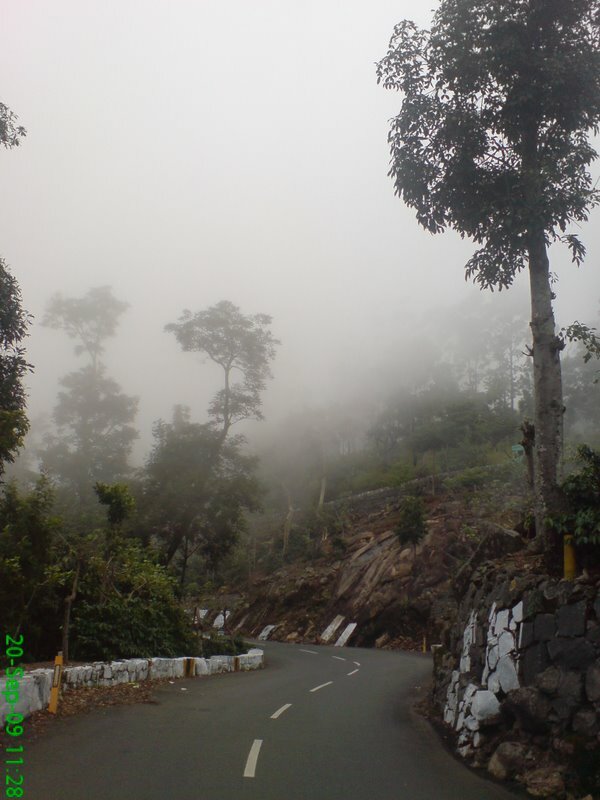 Tales Of A Nomad: Yercaud- Mist, mist and more mist...!! Yercaud- Mist, mist and more mist...!! Until I researched about Yercaud in Wikitravel and google, it was a boring destination for me. I never felt the urge to go there. However everything changed ever since I planned my 2 day visit to the Poor Man’s Ooty (That’s how Yercaud is known as). Its jus 230kms from Bengaluru and my pulsar was more than willing to be vroomed. Sky Roca with an amazing view from its rooms is the most recommended place to stay in Yercaud. Even though it was a long weekend, I somehow managed to get a room there. Wanted to leave at 5 ‘o’ clock in the morning, but a slight drizzle delayed my start by 45 minutes. It was indeed a very light drizzle and I didn’t want to delay my start any further. With the hope that it would stop drizzling once the sun is out, I kick started my pulsar. For a change nature had different plans. It kept on drizzling till I touched Krishnagiri. That was infact a cool wet ride of 80Kms. I did take a couple of tea breaks in between and once the rains stopped, went at a constant speed of 75 kms/ hr. NH-7 is indeed one of the best national highways in the country. It is wide, smooth and the urge to push the needle up on the speedometer is always there. Being a weekend a lot of holiday-makers were out heading towards their various destinations. Just before you touch Salem, the sheveroy hills appear on to your left. Yercaud is a further 30 kms from Salem. The ghat section starts as soon as you leave the Salem town and the monkeys are there all over welcoming you to Yercaud. With a total of 20 hair pin bends it is a beautiful ride up the hill and slowly the mist shows up everywhere. I suppose it was the right time (September) that I visited Yercaud. As soon as I crossed the 17th hairpin bend, the chill breeze hit me and I suddenly found myself biking through the mist. Sky Roca is at the 20th hair pin bend, 2kms before Yercaud town. Even though it was a long ride of 6 hours, I never felt tired as the ride was simply amazing. (Thanks to NH-7 and the lovely ghats).Reached the resort by 12 noon and had a quick lunch at the restaurant. The resort is one of the bests that I have ever been to and the way it has been constructed is fabulous. The view from my room was that of the valleys, the winding roads and the Salem town way below. The resort does have an open sky restaurant which is called Sky Walk. It is a wonderful feel to have coffee out there just staring at the mist. The view from there is of the valley below and you have to literally wait to have a view of the same as the mist hardly gives you a chance. I did manage to see a magnificent sunset from there. It gets very misty and chilly in the evenings. There isn’t much to explore Yercaud other than a few view points and the lake. However the view from those points is mind blowing. All the places are well marked with sign boards and hence you really don’t have to ask the people for the same. As further towards the town from Sky Roca you get the deviation on to the left which leads you to Killiyur falls. The falls is approx. 3kms from the town and you need to walk down further a kilometer from the parking slot. I went down the narrow path a few meters and then climbed back. It was getting cloudy and I did not want to take a risk. I could hear the water falling below, but decided to give it a miss to escape the rain. From there I headed straight to the lake which is right in the middle of the town. The lake looked serene, but being a weekend it was quite crowded. However boating was fun and I went pedaling for half an hour. Even though Yercaud doesn’t boast of a great shopping market, I did a couple of rounds through the area before heading to the resort for a lovely sunset view amidst the clouds. Next day I left for sheveroy temple early in the morning. At more than 5300 feet above sea level, this the highest point in the whole of Yercaud. It is just hills surrounding a small temple in the middle. A deviation of 6kms from the lake will take you to Pagoda point from where you get a wonderful view of the hills and the mist. The winding narrow roads to the point do test your riding skills. It’s a must visit for all coming to Yercaud. I also did visit the Ladies point which is another viewpoint which I should have given a miss as it doesn’t have anything much other than a few monkeys littering around. With all the viewpoints and misty rides done, I left Sky Roca by afternoon and touched Bengaluru by 8pm. That was indeed a long ride and there were two reasons for the same. The first one being that the rain gods wanted to have a little more fun. It poured heavily for 20 minutes while I was crossing the Krishnagiri hills. Without even a shade to rest I decided to take on the rains. I was drenched to the last thread on my body. At last took a small break at the Café coffee Day on the way. The second reason for my long ride was that my pulsar had a flat tyre. However found a puncture shop immediately and that saved me from pushing the 150cc monster. Yercaud is a lovely hill station which many people miss out in the midst of Ootys and Coorgs. I am happy that even though a bit late I didn’t miss out on the Poor man’s Ooty. I haven't heard about Yercaud, you have detailed the place with utmost clarity. Good narration,overall a very nice post. Thank you. It is a beautiful place to visit. Thanks for dropping by. Sounds like a perfect place, and if I am in the lap of nature who needs other attractions, not me. Another great biking trip, I see. Do you have pictures of Sheveroy Temple and the view points? Your descriptions make me want to see them. I do have the temple and view points photograph. It is not that great as it was taken from a mobile camera. Could send it to you if you are keen. Ive been in a similar conundrum as you. yercaud never did excite me as there doesnt seem to be much there. But I might have a change of heart after your blog. Lets see. If dont go with high expectations, you are sure to enjoy the place. Yercaud? I would love to visit this place. It is a wonderful place. thanks for dropping by. Great post...just cant figure out which one to go for..Yercaud or wayanad? Thanks a lot. Both wayanad and yercaud are lovely destinations. If you have more time on hand, visit Wayanad or else go for Yercaud. Am sorry, I do not have the contact number of Sky roca. Had been there a few years ago. It should be easily available on their website. Thank you. The roads to Nandi hills are very safe to ride. It is always recommended not to switch off vehicles when on the down ride. The roads are good and it is a lovely ride all the way. Enjoy! Hi, awesome write-up and snaps you have got there. I kept postponing Yeracaud since long tile. Will surely visit this time. I am planning to head there this weekend (11th May) , any info on if this a good time to visit? Thank you. It mite be quite hot during this time of the year. The best time would be post monsoons till february. A very clear and nice post about the spot.... We may visit the place around 27th june...... All your posts are lucid , interesting and with beautiful pictures capturing the essence of the place. Glad you liked it. Enjoy your holidays. The rural areas must be nice there, I guess. Really beautiful place. Thanks for sharing!